Although the US stock market is smoking, and the unemployment rate is low, there remains an underlying feeling of dread among some analysts who say America has yet to pay the piper for its gains. Will Donald Trump bear the cost of disastrous Fed policy? On the 2016 campaign trail of tears, many observers were mud-wrestling with the question: Was Donald Trump the real deal, or was he - like the snake-oil salesman who preceded him - just another silver-tongued orator with a gift for bamboozling voters? Just one week in office, the results are in: the maverick from Manhattan is pure 100 percent anti-establishment gold; the real deal. He’s already signed off on a raft of executive orders undoing a chunk of Obama’s last-minute legacy, including withdrawing the US from TPP and ordering bricks for his Mexican Wall. The Washington elite, comfortable for so long in their lobbyist-bought fortress, are holding their breath as Trump continues draining the proverbial swamp. However, the real estate developer probably understands better than anyone that when you drain a fetid body of water you are bound to wake up some monsters. And we’re talking about Loch Ness-size monsters here. And while Trump’s mighty pen may have already slain some dragons, other creatures will require a bit more work. And there is no more fearsome creature in Washington, DC than the US Federal Reserve, which possesses the power to make and break presidencies. 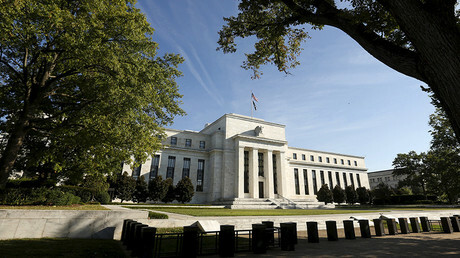 Much like the US Supreme Court, the Federal Reserve is designed to serve as an apolitical institution operating beyond the pale of Washington intrigue and influence. However, trying to remove political inclinations from any Washington agency would be like trying to tell a New York Yankee fan to ignore baseball statistics. 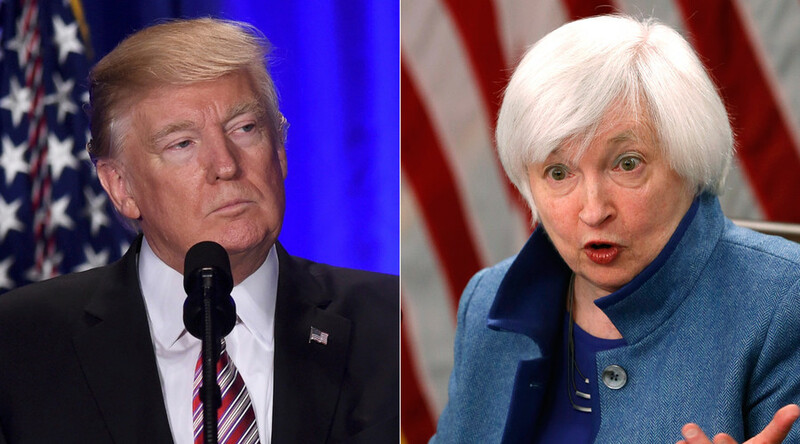 Trump acknowledged as much in the heat of the campaign when he accused Federal Reserve Chair Janet Yellen, 70, of suppressing interest rates due to political pressure from the Obama administration. "Well, it's [the interest rate] staying at zero because she's obviously political and she's doing what Obama wants her to do," Trump told CNBC in September, saying Yellen should be "ashamed" of what she was doing to the economy. Indeed, 'doomsayers' say the US economic recovery is a grand illusion conjured up by the Federal Reserve, which is printing money faster than toilet paper, propping up "too big to fail" institutions that should have gone the way of the dinosaurs. The Central Bank has raised interest rates just once since slashing them to zero following the 2008 financial crisis. Now it appears that Janet Yellen is wielding the magical power that could sink the mighty Trump: higher interest rates. Trump the shrewd businessman, however, fully understands the threat that hangs over his presidency like the Sword of Damocles: “Any increase at all will be a very, very small increase because they want to keep the market up so Obama goes out and let the new guy...raise interest rates...and watch what happens in the stock market," Trump said. In other words, any popping of the bubble created by all of this loose money sloshing around inside of the US economy will be blamed on Donald Trump, a man who the Washington elite view as a lethal threat to their globalization plans. "Ask for resignation on January 20th because unless this bubble is lanced, there is a huge bubble in these markets, the Trump administration is never going to come out the other side,” said Stockman, who served as the Director of the Office of Management and Budget under President Ronald Reagan. "And he would be well advised to clean house, if you want to drain the swamp, the place to start is in the (Federal Reserve) building because where this entire false economy, this big fat, ugly bubble that Trump talked about during the campaign actually originates,” he said. Jim Rogers, the American businessman and investor, told me President Trump would be wise to relieve Yellen of her duties, but he doubted the US president has the powers to demand her resignation. “I do not think he can since she has a fixed term,” Rogers said via email. Indeed, it seems that the US Federal Reserve Chair, like the Bishop of Rome and the Supreme Court justices all enjoy life tenure regardless of their performance. Yet it has been this very private corporation, the US Federal Reserve, created on December 23, 1913 (while most lawmakers were away on Christmas break), which seems to have been largely responsible for the financial crisis of 2008. As Time magazine put the matter: “The super-low interest rates [former Fed Chief Alan] Greenspan brought in the early 2000s, and his long-standing disdain for regulation are now held up as leading causes of the mortgage crisis. Greenspan went on to tell a congressional hearing that he had "made a mistake in presuming" that financial firms could regulate themselves. The era of super-low interest rates and easy money continued with Greenspan’s successor, Ben Bernanke, and has not appreciably changed course under Janet Yellen, who took over the Chair in January 2014. The Federal Reserve raised rates in December, only the second time in a decade. Ron Paul, former US congressman and the author of the best-selling book, 'End the Fed', explained how long-term low interest rates work to increase economic inequality. 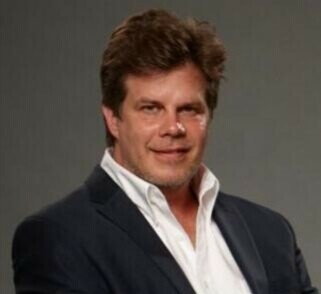 “Federal Reserve-generated increases in money supply cause economic inequality… because, when the Fed acts to increase the money supply, well-to-do investors and other crony capitalists are the first recipients of the new money,” Paul wrote. “By the time the increased money supply trickles down to middle- and working-class Americans, the economy is already beset by inflation. So most average Americans see their standard of living decline as a result of Fed-engendered money supply increases,” Paul added. In other words, 'socialism for the rich, capitalism for the poor'. The ultra-wealthy never have to fret over bad investments because they are immune from risk - exactly the thing that makes Capitalism today largely redundant. Now we're all facing risk, rich and poor alike. That's because the Fed has kept interest rates in the basement for so long that to raise them in any appreciable way could spell doom for Trump’s efforts to jump-start the American economy. While Trump can use his executive authority to deal with agencies and agreements he finds repellent, attempting to tame the Fed is an altogether different ballgame. Alan Greenspan, who served as Fed Chair for 19 years, was asked in an interview what he thought the relationship between the Federal Reserve Chief and the President of the United States should be. His reply was shockingly candid. Greenspan's comment nicely summed up the challenge now facing Trump, a man who doesn’t seem to handle rejection real well. Thus, it is reasonable to suggest we are heading for a major clash between his administration and the Central Bank down the road. The question now is whether it will be Donald Trump who is chosen to 'pay the piper'. Although it is impossible to predict if the US economy will crash on Trump's watch, we do know with absolute certainty that nothing would please the establishment elite more if that were to be the case. *Presently, the US national debt stands at $19.9 trillion dollars. For a shocking glimpse at the US Debt Clock, click here.